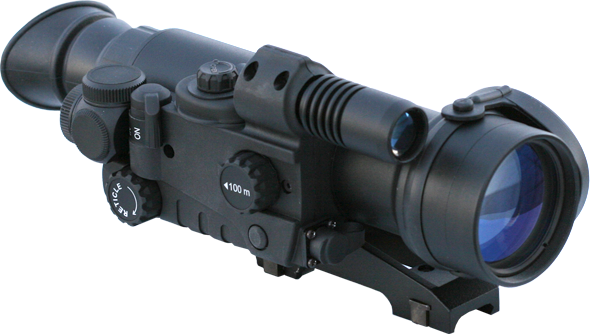 Viewing range has been substantially increased due to the use of a built-in IR Illuminator in the L series of the Sentinel NV riflescope. As compared to LED diode based IR Illuminators, laser Illuminators feature enhanced efficiency (operating range in similar conditions, quality of light spot) and essentially lower power consumption. The reticle in the Sentinel riflescope has brightness adjustment and features two scales – a horizontal scale for measuring distance to the object with known width; and a vertical scale, which enables adjustment of the aiming point at a distance of 15,25,50 and 100 m. Reticle colour can be switched from red to green. The Sentinel is remarkable for its modern, light weight and rugged design due to modern plastic and Titanium employed in the riflescope's manufacture. The riflescope can operate under precipitation of any intensity. The remote control duplicates the “on/off” function of the device and IR illuminator. The third button is intended for a quick start-up of the riflescope and IR illuminator (the device works only when the button is kept pressed). This is very convenient when constant observation is not conducted in order to find the appropriate position, take aim and shoot. Protective lens cap is permanently attached to the body to prevent it being lost and can be slid back down the body when observing or shooting. The Weaver rail fixed on the left side of the body is used to accommodate additional accessories (IR flashlight, DSAS, red dot laser).